The rise of the crypto ecosystem has often been compared with the early years of the internet. 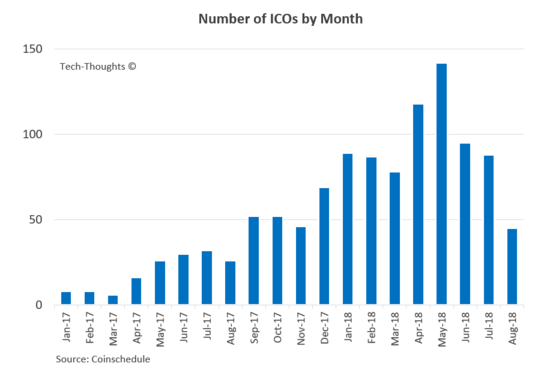 In addition, the peak of the crypto asset bubble in December 2017 has been compared with a (smaller scale) dotcom bubble. Beyond parallels in price inflation, many also hope the ecosystem is a similar inflection point in terms of innovation and adoption. 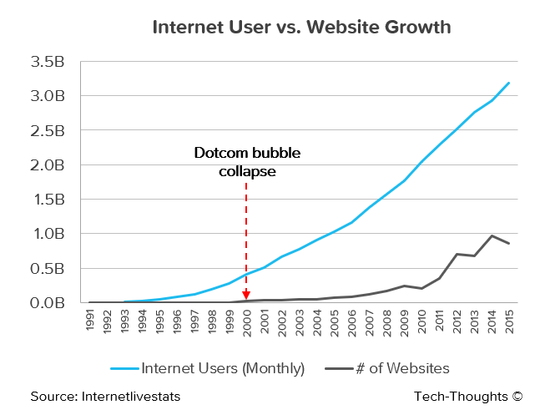 As the chart above shows, the dotcom collapse was merely the beginning of the internet revolution which led to unimaginable innovation and near-universal internet adoption. Is this where we are on the crypto adoption curve? In just 6 months, we've moved on from cryptopalooza to scooterpalooza. As good of a topic as any to come out of a long hiatus from this blog, at least for now. Scooter sharing startups in Silicon Valley like Bird and Lime are in the midst of an overheated investment cycle, raising follow-on rounds mere weeks after the initial with 2-3x valuation jumps. Spin, a smaller competitor, is also finalizing a security token offering, combining the hype cycle with the last one. Ignoring the latter for now, is the interest in scooter sharing startups warranted? Amazon stunned the business world on June 16 by announcing that it will acquire Whole Foods Market and its 450+ retail locations for $13.7 billion. While the response to the deal was largely positive for the two companies, there still appears to be a lot of debate about Amazon’s goals. Interestingly enough, Amazon’s retail strategy has been public for months. The Amazon Go announcement in December 2016 laid out the company’s vision for retail in the mobile first world. But before Amazon could move forward with this vision, it had to contend with the challenges it has faced in the grocery space. Following Google’s AI-focused event in May, Apple kicked off its Worldwide Developer Conference (WWDC) with an action packed keynote. Apple broke precedent this year by announcing a multitude of hardware products, including new Macs, iPads and even an Amazon Echo competitor dubbed HomePod. However, given the size of the iOS installed base, improvements to the iOS platform were arguably the most significant. Let’s dive into these, starting with an update on the world’s most lucrative app store.